You can do folder and file sharing in your home network, so that they can be read or written by other users. However it's not advisable to share your folder with write permission, unless it's really needed. There is user who prefers to share the drive (C:, D:, E:, etc) on the network, but it’s not recommended. Sharing drive is dangerous, if your computer is not patched, configured and secured properly, your computer will be attacked by virus/trojan easily by sharing the drive. So, the best way is, only share the folder which you need to share. Only assign write permission to folder if really needed. To make file sharing work better in your network, it’s better to assign all computers to the same workgroup. 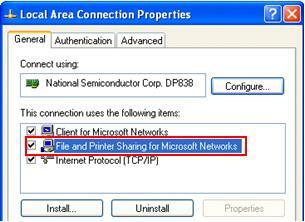 Note: Before you start, make sure you've enabled File and Printer Sharing for Microsoft Networks on network card's properties. If not you won't be able to do file sharing. 1) Without wasting more time, Let's start! 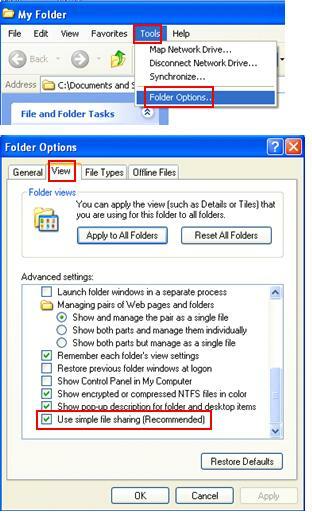 Open the folder which you plan to share, go to Tools and click Folder Options…. After that go to View tab, scroll down in Advanced settings section and make sure Use simple file sharing is enabled (default is enabled). Click OK and close the window. 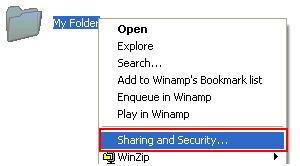 2) Proceed to right click the folder you wish to share and click Sharing and Security. Note: If you are logged on as a guest (a guest account provides access to the computer for any user who does not have a user account on the computer), you cannot create a shared folder. Note: The Sharing option is not available for the Documents and Settings, Program Files, and WINDOWS system folders. In addition, you cannot share folders in other user’s profile. Note: When you share a folder, you also share all of its subfolders unless you make them private. 3) Your folder Properties will appear. 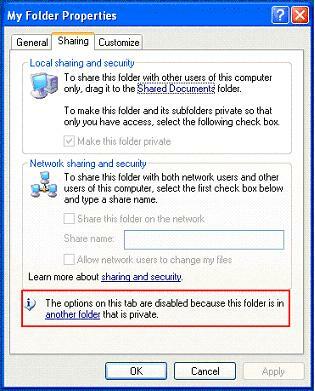 Select Sharing tab and tick Share this folder on the network to share the folder. You can type in a new name in the Share name text box to change your folder name on the network, however this will not change the folder name on your computer. Click Apply. Note: Don’t tick Allow network users to change my files (give write permission to other users) unless it’s needed. Note: If the sharing options are grayed out as shown below, this is because the folder is in another folder that is private (don’t allow folder/file sharing). Just click that another folder link to disable the private option. Click here to learn about how to make folder private instead of file sharing. 4) Once you have shared the folder, you will see there is a hand supporting your folder. You have successfully shared your folder.